Not only that, but I thought you really should have the opportunity to get your ‘hands dirty’ with a little spinner freebie of your own. 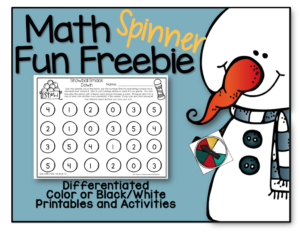 So, I’m not only am I giving you the lowdown on January’s math spinner pack, but I have a free activity for you to try with your own kiddos as well. 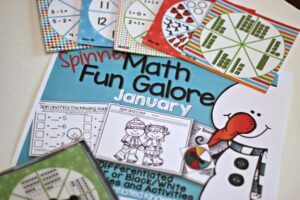 Spinner Math Fun Galore for January has a nearly 20+ different activities that you can use in your classroom, and to extend learning even farther, there are five different, tiered spinners that you can choose from to address the skills your students really need to practice. Oh, and I need to make sure you all know this . . . even though I have printed my own sets out in color . 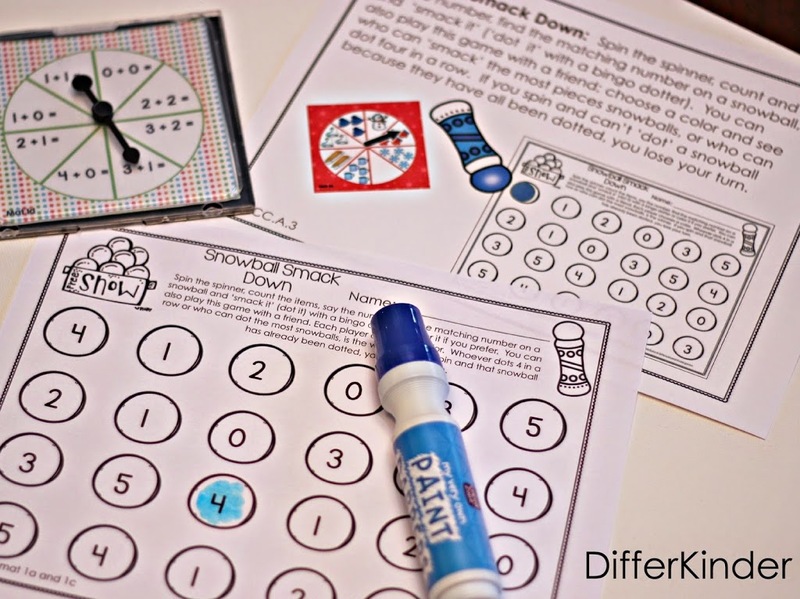 . .
ALL ACTIVITIES ARE AVAILABLE AS BLACK AND WHITE PRINTABLES. So you choose! Personally, I like to provide color spinners, and I often print out colored recording sheets and laminate them. It just depends on the activity. Each activity in this packet comes with an ‘I Can . . .’ or student activity instruction card like the one below. 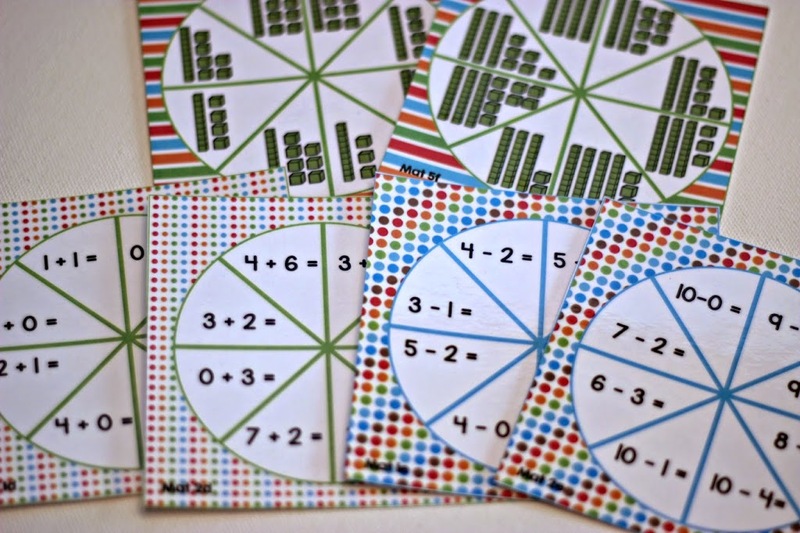 It provides a visual reference so that students remember how to play. 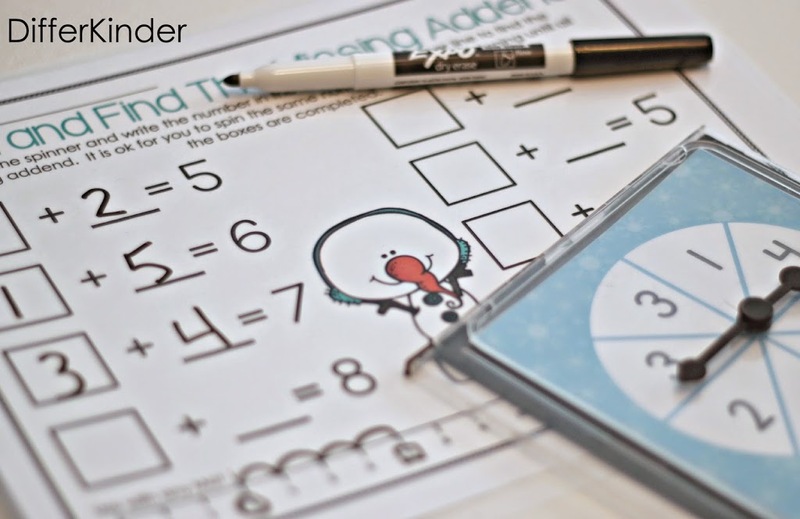 My spinner activities are pretty consistent from month to month which makes students become independent very quickly with them. While the skills may change, they are very familiar with the activities and games. Of course, this means . . . INDEPENDENCE . . . which I love. 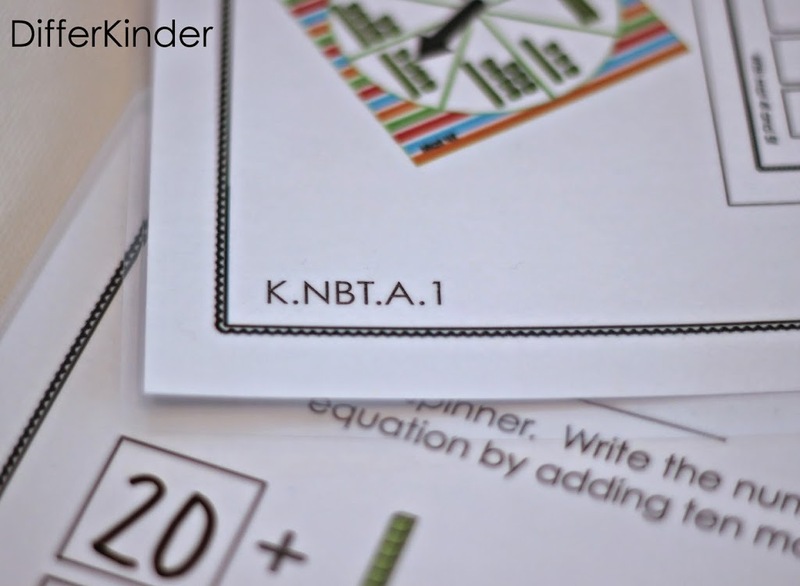 Each instructional card also references the Common Core Standard that the activity reflects. That way when your administrator walks into your classroom and says, ‘why are all these kids laughing and having fun with these spinners . . . they can’t possibly be learning anything,’ you can just grab your ‘I can’ sheet and refer to the CCSS. It’s all good. There are so many spinners for you to choose from in this packet. Here is just a quick look of how many spinners and their tiers. There are two tiers of counting spinners. 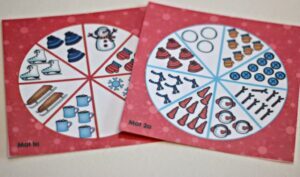 There are 4 tiers for numerals and tens frame numbers. 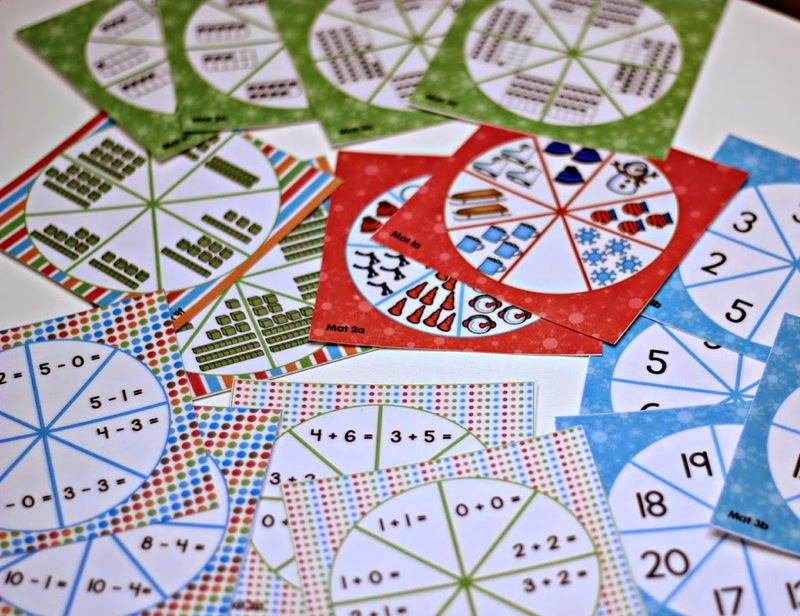 There are two tiers each for addition, subtraction and tens and ones spinners. 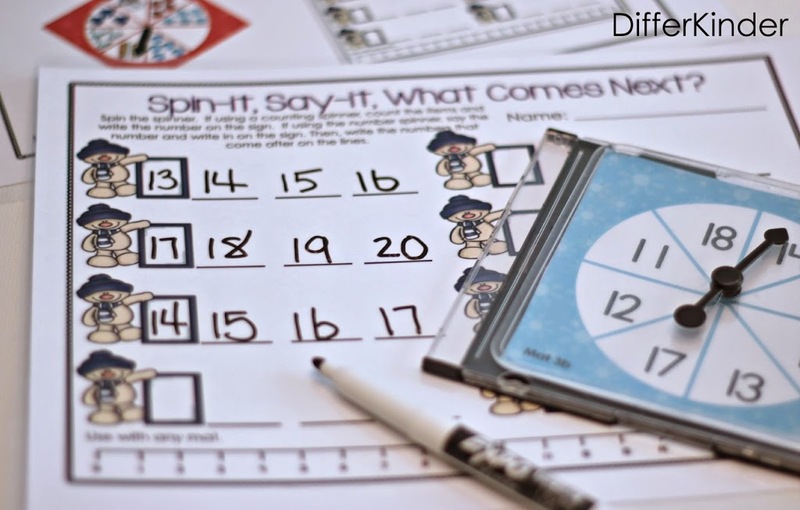 One Less Number: Teachers choose the spinner skill you want students to use and the tier, students spin the spinner and use the number to find one number less than the number they had on the spinner by subtracting one. One More Number: Like One Less Number, but this time students add one number to the number on the spinner. 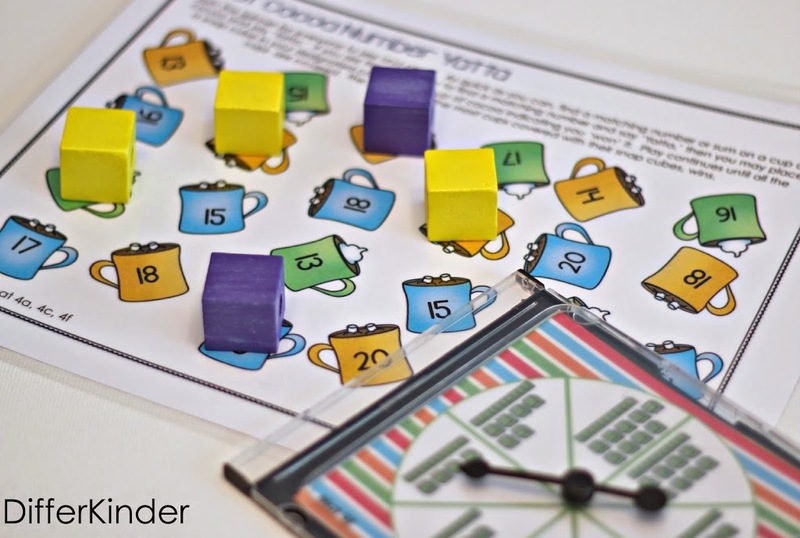 Hot Chocolate Number Yatta: Students spin the spinner and try to be the first to find the number on the playing mat. When they find it, they say YATTA and can place their playing piece (or you can use a colored dry erase marker to mark your cups won) on the mat. This is a classroom favorite for sure. 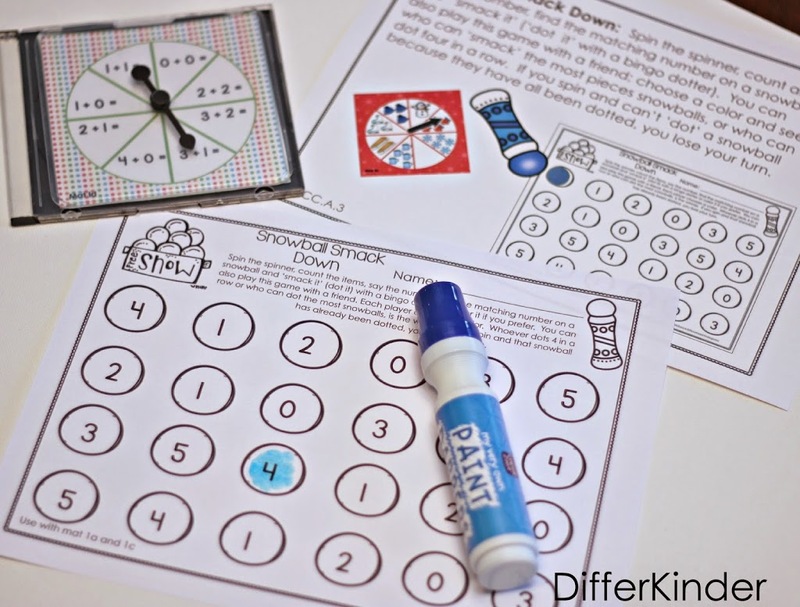 Snowball Smack Down: Students spin the spinner (use whichever skill you’d like) and ‘smack’ the snowball ( I use bingo dotters to dot them.) with the number. You can play against a friend to see who is the first one to fill their sheet, four in a row or play by yourself. 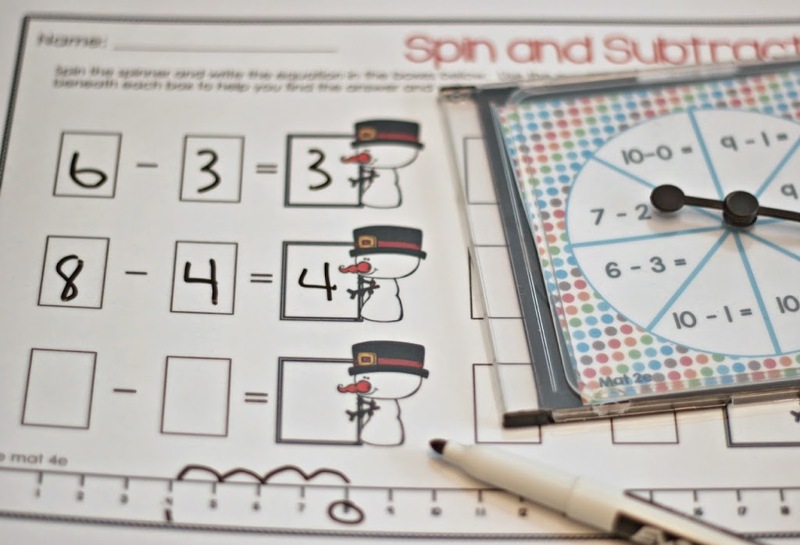 Spin and Add: Like Spin and Subtract, teachers select the tier and students spin, write the equation and find the answer. 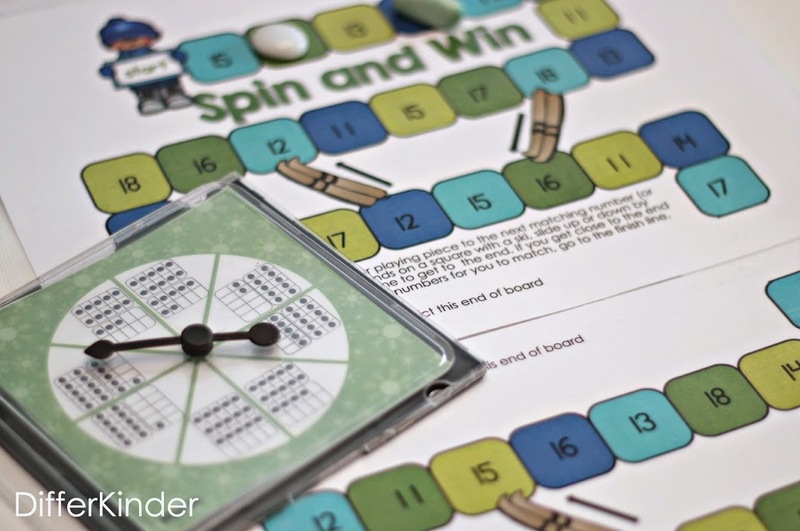 Spin and Win: This fun board game can be played with any of the spinners. There are several tiers from which to choose. 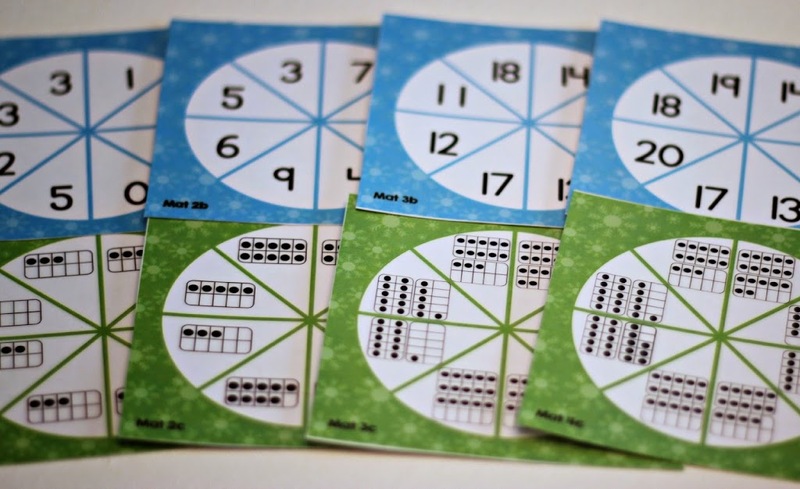 Teachers select the spinner for their students, students spin, locate the corresponding number on the game board and move their playing piece. Spin-it, Say-it, What Comes Next? 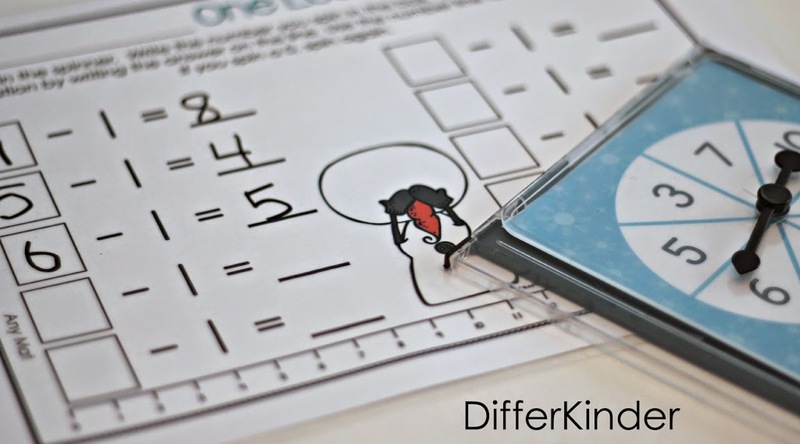 : I especially like this one for students still struggling with teen numbers and number identification. 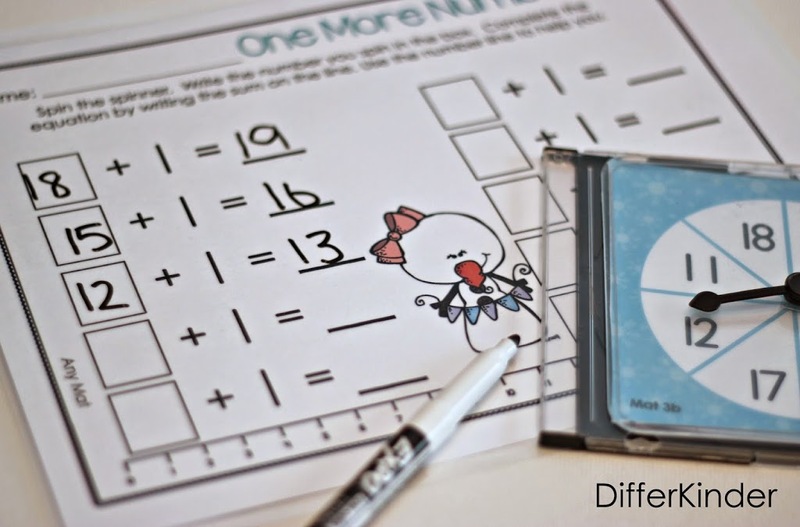 Students spin the number, identify the tens frame, count or figure out the number in tens and ones and write it in the box. Then they write the numbers that come after. There is also a version for numbers that come before and before and after. 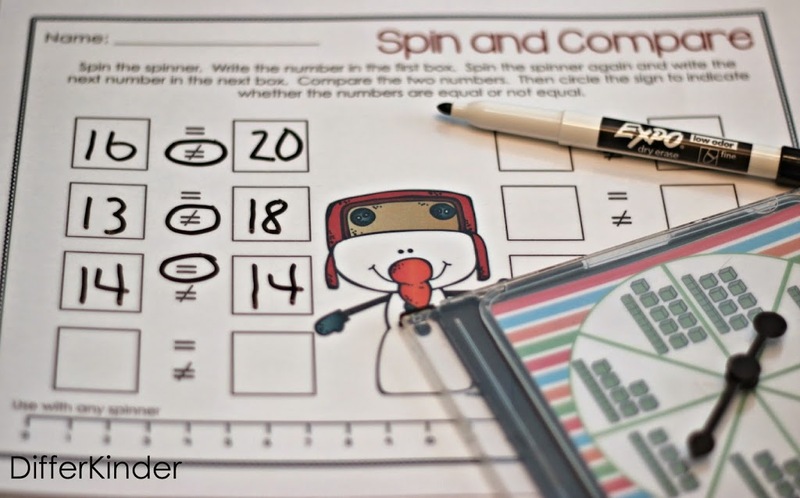 Spin and Color: Students spin the spinner, solve the problem or identify the number and then color the corresponding number on the picture. 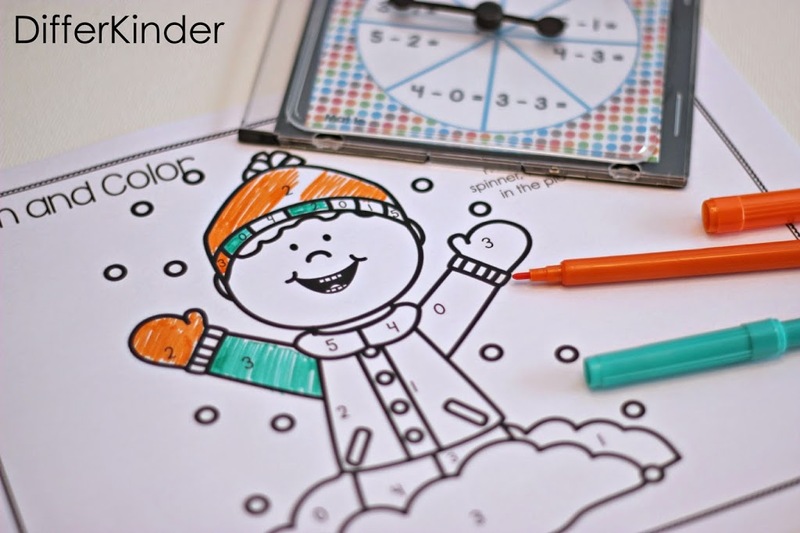 You can play with a friend and see who can color the most or finish their picture first. 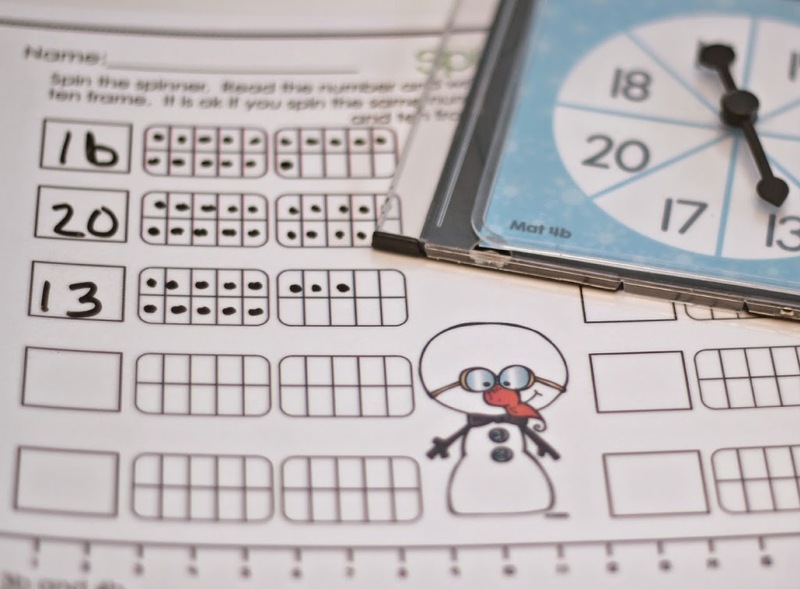 Spin, Read, Show: This activity will have students showing how they represent numbers as ten frames. 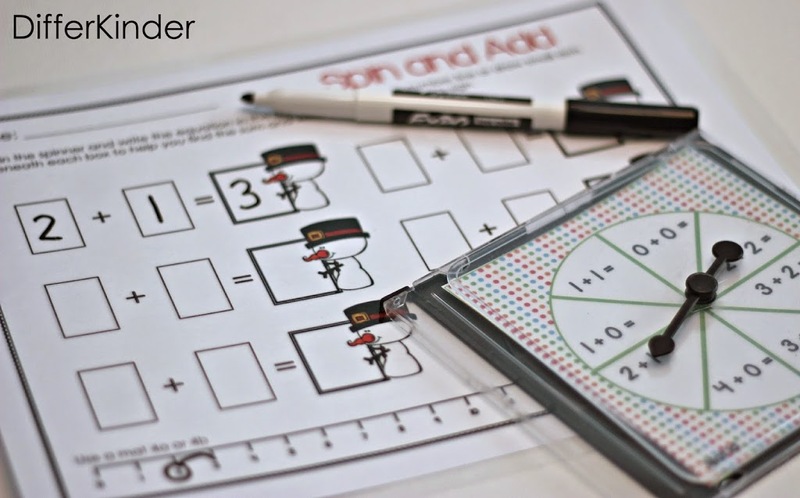 Students spin the number, write it it in the box and then show the number as a ten frame. 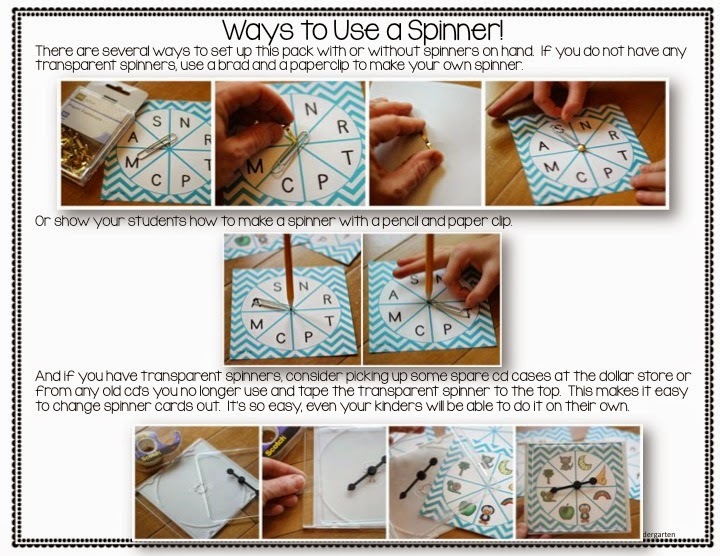 Spin and Make Ten: For those students not quite ready for missing addend, I offer Spin and Make Ten. This concept, using the ten frame numbers, seems a bit easier to grasp. Students spin the spinner, find the number, write it in the box and indicate how many more are needed to make ten. 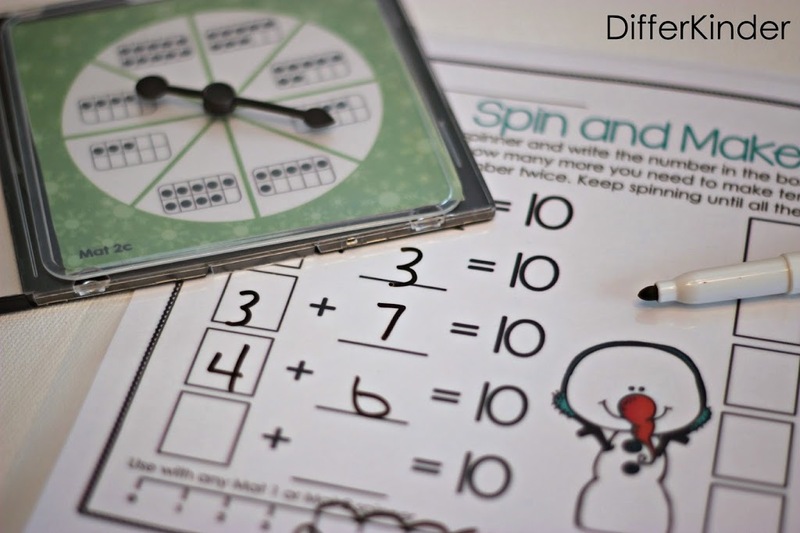 Spin, Read and Write: As with all the activities in this packet, this one is also tiered for difficulty. Students spin a number and use the word bank at the bottom of the page to write the corresponding number word. 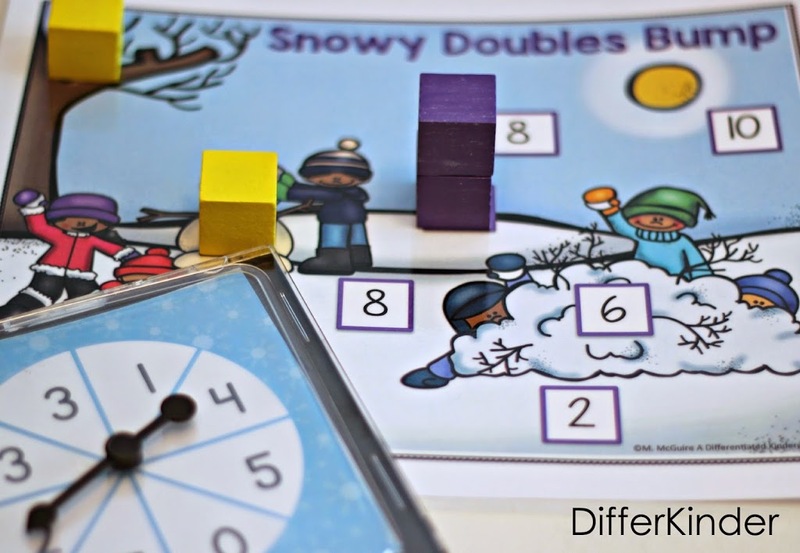 Snowy Doubles Bump: My students have been obsessed with doubles lately so I created this doubles bump game for them to use. They spin a number, double it, and place their playing piece on top of that number on the playing mat. Of course, if someone else gets that same number, they can bump you off unless you have secured your spot with two playing pieces. My kinders love any kind of game play so this station is always a hit. 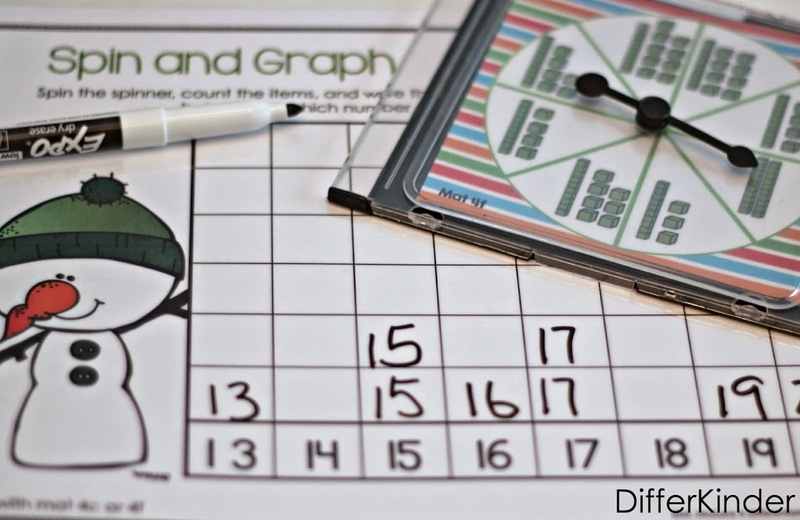 Spin and Graph: Teachers choose the spinner and level of difficulty. Students spin, find the number and then write the number on the recording sheet. 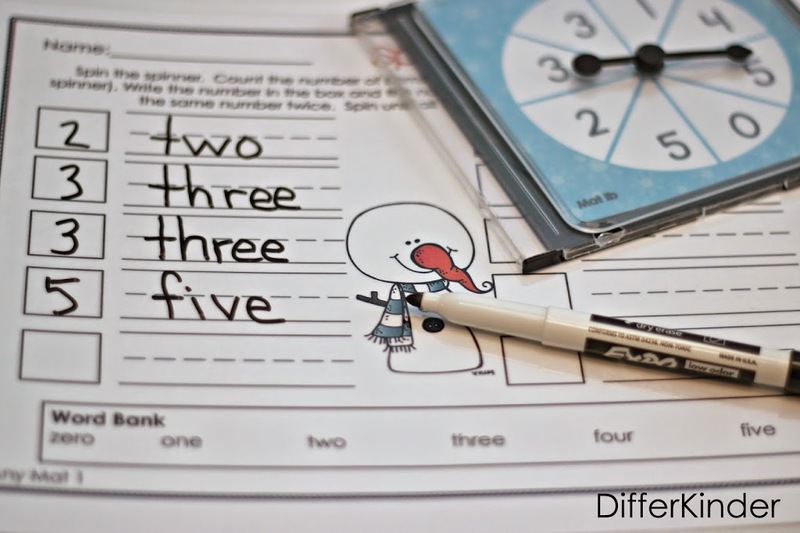 I like this activity especially when I use a tens and one spinner. Spin and Compare: There are actually a couple of versions of this. This one is for equal and non equal numbers, and there is another for greater than/less than numbers. Students spin one number and write it in the first box. Then they spin again and write it in the next box. They then go back to determine if they are equal or not equal (greater than/less than). So there you have the majority of the activities included in this pack. You can see it’s a pretty hefty packet. There are so many activities to use in so many ways. It’s really packed full. 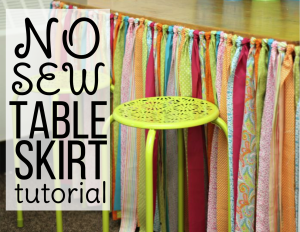 So are you ready to try it out in your own classroom? Great! Here’s a little freebie to get you started. All you have to do is click on the picture below. While you’re there, make sure you follow my TpT store so you get notifications about all my new products and freebies. Now remember, you don’t HAVE to use transparent spinners like I have here. You can use a pencil and paperclip or poke a brad through the middle and attach a paper clip. Those are both great ways to make cheap and easy spinners. However, if you would like to get a hold of some good spinners, lately I have been using these. They are very reasonable. That’s a pack of 5 for $12.32, and, if you have Amazon Prime, you get free shipping. I simply tape the spinner to the top of a cd case that I purchase at the Dollar Tree and place the spinner card inside the cd holder. It’s a simple change out system. I hope you enjoy this little sample activity from my Spinner Math Fun Galore for January. Leave me a message and let me know what you think. Everything looks amazing of course!! Love all the pictures and descriptions! I’m excited to use it in my classroom! Great idea using the CD case with the spinner. Those spinners are well worth the investments!! Thanks, Marsha! Linda G.
Thank you for the freebie!! I also own your Dec spinner set and love it! Maybe I am not seeing it, but I can’t find a 3a and 4a spinner in either set. Help? Our kiddos love anything with spinners! These look fabulous! 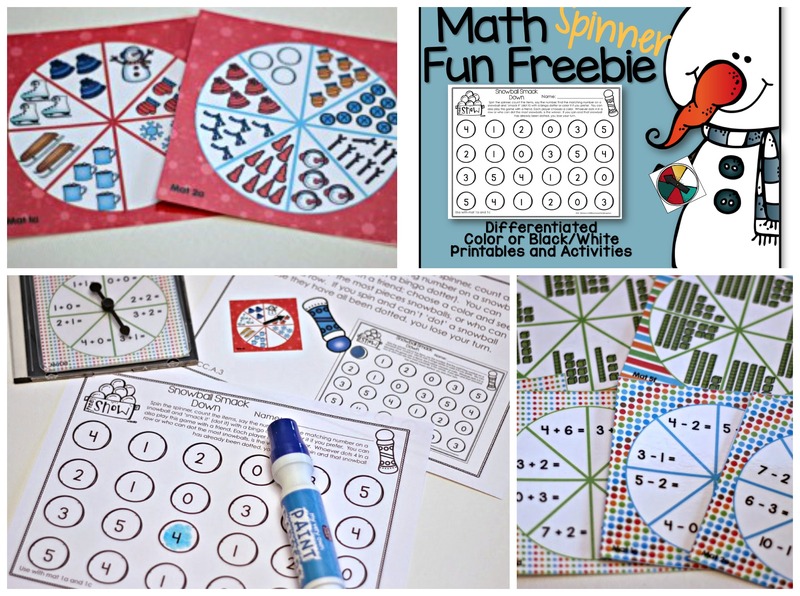 So fun for kids to learn their math skills. Thanks, Marsha!! I can’t wait to use this next week. This looks great! On my way back to your TPT store.